Ayurvedic nasal detox is the process of draining the sinus, respiratory tract and the tissues around. 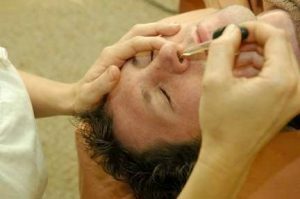 During nasal detox after massaging and applying steam to head, sinus and chest, Ayurvedic herbalized oils are dropped into each nostril. Oils are selected according to your body type and/or health issues and the number of drops depends upon intensity of imbalance, body type and season.